AN arrogant Deputy Commissioner of Police (DCP) Akhilesh Singh who has a reputation of blatantly flouting the law and order himself and not working by the spirit of the law, completely disregarded the working motto of Honorable Prime Minister Narendra Modi who coined the term ‘Mahilaon ke samman mein, BJP maidan mein.’ DCP Akhilesh Singh has shown that he does not care about this government’s motto and does exactly opposite, by showing complete disregard, apathy and makes a mockery of woman social activist. Arti Bharat Pandya, a social activist from Ghatkopar has complained against Akhilesh Singh saying that he lacks manners and etiquettes on how to behave and deal with women. Arti Pandya also alleged that Akhilesh Singh has threatened her by saying that he will book her in a false case in future so that he can get back at her and exact his revenge. On May 24, 2018 Arti Pandya had complained (copy with ABI) against Akhilesh Singh as well as Inspector Vijay Shinde from Pant Nagar police station and Police Inspector Vilas Datir of Ghatkopar police station. Arti Pandya is a resident of Ghatkopar and President of NGO Ghatkopar Garjana Sevabhavi Sanstha (GGSS). Akhilesh Singh is DCP zone -7 in Mumbai Police. On May 5, 2018 Arti Pandya had complained to Ghatkopar police station, Assistant Commissioner of Police (ACP) and also Akhilesh Singh that her NGO is running a campaign against illegal gambling and Nasha. She is also receiving complaints from local residents against gambling den situated above Ashish Bar, Asalpha link road, Ghatkopar (west) being run by Satish Shetty alias Anna. When police did not act on her complaint she met Akhilesh Singh on May 17, 2018. She produced video footage of how gambling den is being run on abovementioned address. Akhilesh Singh assured he will take action. After repeated complaints, finally on May 22, 2018 around 11.30pm Akhilesh Singh sent Inspector Vijay Shinde from Pant Nagar police station to raid on gambling adda. 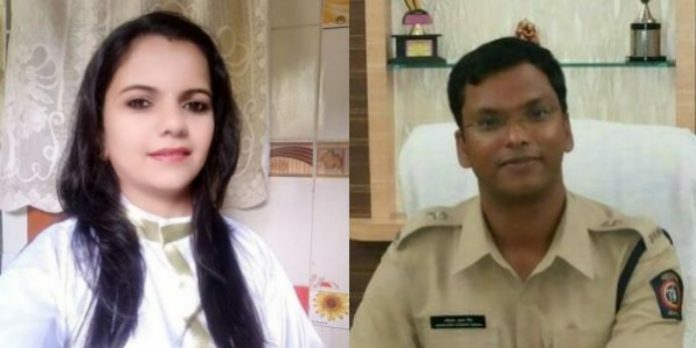 Vijay Shinde accompanied with Arti Pandya reached on spot but refused to carry out the raid saying matter belongs to local police station Ghatkopar. He called PI Vilas Datir on spot. Vilas Datir reached. They chatted with each other and told Arti Pandya that they have no rights to break/open the door as it was shut down from inside. They called gambling adda owner Satish Shetty. Chatted with him, laughed on naivety of Arti Pandya, shook hands with each other and left. “Shinde ne kaha ki yeh local police station ka matter hai. Unhone Ghatkopar police station ke PI Vilas Datir ko bulaya. Shinde aur Datir ne kaha ki unhe kisi ka darwaja todne ya kholne ka adhikar nahin hai. Unhone gambling adda malik Satish Shetty ko bulaya. Us se khoob hans- hans kar baat ki. Mere upar bhi we khoob hanse aur Shetty se haath milakar chale gaye,” said Arti Pandya. “Char ghante intezaar ke baad main jaise hi unki cabin me gayi. Wo bhadak gaye. Bole – “tu mere paas bogus kaam lekar aati hai ? tere jaise 50 informers hain mere paas. Tu kitna padhi-likhi hai. Apna education certificate dikha. Maine kaha sir main woman activist hoon to we bole tere jaise bahut woman activist dekhe hain. Tere par main kanooni karwayi karoonga. Maine insult feel karke vapas aakar road par rickshaw pakad rahi thi to ek policewale ne bulaya ki DCP saheb bula rahe hain. Main vapas gayi to unhone kaha tu apne ghar ka address bata. Tere upar main jaroor kanooni action loonga,” said Arti. “Akhilesh is not fit to be posted in Mumbai police. He was acting like a constable not an IPS officer,” said Arti Pandya.